Children are warmly enfolded into and are an important part of the intergenerational environment at St. Elisabeth’s. We believe our youth are respected members of the community, involving them in many aspects of church life, facilitating genuine relationships with individuals across all age spans. St. Elisabeth’s has built-in “grandparents,” “cousins,” and “grandchildren,” especially important to our members whose extended families live far away. For children 3 and under, we have professionally-staffed childcare from 9:45 AM to Noon on Sundays. 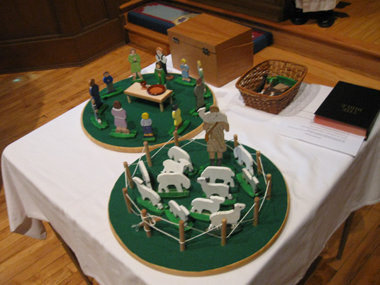 For children 3 through age 12, we offer the Catechesis of the Good Shepherd (CGS), which begins at 9:50 AM and concludes with the children coming in to join the rest of the congregation for communion. All the children are invited once again to come up to their Atrium to finish work after coffee hour, approximately 11:20 to 12, as their parents participate in adult formation (forum). CGS was developed by Sofia Cavalletti, based on the work of Dr. Maria Montessori. It is based on the premise that God and the child are already in relationship, and the role of the adult (the catechist) is to nurture their bond with God through the environment, which we call the Atrium. We have two Atrium rooms, one for ages 3-7 and the other, ages 7 through 12. Age appropriate themes from the Bible and liturgy are presented to the younger group that focuses on God’s great love for us. The older children begin to see that His love has been given to all of humankind over all time. Their foundation of His love is put in the “cosmic” context and thus, the children ages 7-12 consider how humans respond to this great love. Children older than 12 are part of the regular worship, and take some special parts in the service by collecting food donations and bringing the gifts to the altar. Beginning in fifth grade, young people are trained as acolytes to assist the priest at the altar. Other children might also select to be a Junior Catechist, serving in the Atrium. Throughout the year, there are many opportunities for service, worship, and learning that are intergenerational in nature. These options are popular because parents and children can learn and grow together in their faith.